The chemical and biological effects of ionising radiation originate from two basic types of interactions. In direct action the radiation energy is deposited directly in targets. Indirect action refers to absorption of energy by the external medium, leading to the production of diffusive intermediates which then attack the targets. The "dilution effect" distinguishes between direct and indirect action. Consider a medium containing C0 target entities per unit volume. In direct action, the damaged fraction of entities C*/C0 does not depend on C0 because the total energy absorbed by the entities increases linearly with increasing C0. For indirect action, C*/C0 decreases with increasing C0 because the energy absorbed by the medium is independent of C0. (These predictions fail at very high C0. ) Both direct and indirect action may contribute to radiation damage at the cellular level. The effect of ionising radiation on a biological system is quantified by the radiation sensitivity (S), which is defined as the reciprocal of the radiation dose required to cause a certain fractional change in a selected property. 1/D37 is frequently employed as measure of radiation sensitivity, where D37 is the radiation dose at which approximately 63% of the starting entities have acquired the specified damaged. Various factors may contribute to radiation sensitivity at the cellular level, including the specific biological function that is affected, the type or "quality" of the radiation, ambient conditions, presence of agents that sensitize or protect against radiation damage, and cellular repair processes. Cell cycle, dose rate, and dose fractionation are additional determinants of mammalian cell radiation sensitivity. Radiation damage in higher animals is defined in terms of LD50, which is the radiation dose which has a 50% chance of lethality. For humans exposed to whole body gamma-rays, LD50 is about 5 Gy. Conservation of energy is the key principle controlling the interactions of ionizing radiation with matter. For example, ejection of an electron from an atom by an x-ray requires a photon energy at least as large as the binding energy of the electron. However, the net effect is more complicated because the excess kinetic energy of the ejected electron and recoil ion are dissipated at later times and different locations. There is no comprehensive theory of radiation interactions owing to the multiplicity of possible effects. Instead, a number of different mechanisms are cobbled together in order to give an overall view. An elegant theoretical approach to direct action of fast electrons is based on concepts of molecular photophysics. An isolated molecule experiences an electric pulse when a fast electron flies past it. It can be shown that the transfer of energy from the electron to the molecule is equivalent to bombarding the molecule with a stream of "virtual photons", whose energy varies from zero to a maximum of hV/b, where V is the electron velocity and b is the distance of closest approach. For example, the maximum virtual photon energy is about 1200 eV for a 0.5 MeV electron passing 1 nm from a molecule. The detailed theory shows that the number of virtual photons possessing a given energy is inversely proportional to that energy. 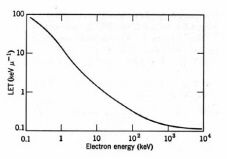 Each interaction transfers less than 0.02% of the initial energy of the fast electron. However, the energy range of the virtual photons is ample to induce electronic transitions. Molecular measurements in the gas phase have led to detailed information about the excitation properties of atoms and molecules which can be utilized for quantitative calculations. Elementary radiation theory shows that the number of molecules raised to a given state of excitation is proportional to fe /e, where e is the energy of the optical transition and fe is a number proportional to the probability that the absorption of a photon by the molecule induces the given transition; fe is termed the oscillator strength of the transition. The ionization potential of most atoms and molecules in the gas phase is the order of 10-15 eV, e.g., H, 13.6 eV; O2, 12.1 eV; CH4, 12.7 eV; C6H6, 9.2 eV. Accordingly, the higher energy virtual photons are expected to induce ionisations while low energy virtual photons induce electronic excitations. Allowed (i.e., highly probable) optical transitions take place in 10-16 - 10-15 s which is a short time compared to the period of molecular vibrations, which is 10-14 - 10-13 s. Thus, the primary excitation act is relatively unaffected by the environment of the molecule and the basic features of the excitation process in a condensed phase are expected to be similar to the gas phase. The fate of the secondary radiation products may be quite different in a condensed medium. This theory provides information about energy transfer from fast primary and secondary electrons and secondary electrons generated by energy transfer from x-rays, gamma-rays, and heavy charged particles. Information about the primary interactions of heavy particles and EMR derives from energy loss theory as developed in nuclear physics. where Wmax is in eV. Thus, the secondary electrons generated by a 5 MeV alpha particle range up to about 300 eV of kinetic energy. The more energetic secondary electrons can initiate additional ionisations, while less energetic secondary electrons induce electronic excitations. The lowest energy secondary electrons are referred to as "sub-excitation", whose role in biological radiation damage remains unclear. Since only a small fraction of the initial energy is transferred at each event, a track consisting of clusters of ions or spurs is generated along the path of the moving particle. Most spurs in water comprise 1-5 ion-pairs. These tracks may be visualized in a cloud chamber by their vapor trail. High-energy secondary electrons are occasionally generated. 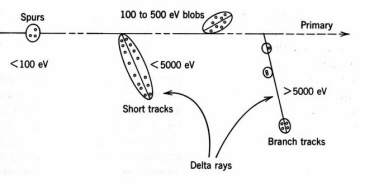 Energy loss by these energetic electrons leads to short branching tracks or "delta rays" (Fig. 6). Delta rays may terminate in larger pear-shaped regions of ionisation or "blobs". Similar considerations apply for energy transfer to a fluid medium in indirect action. Table 3. Penetration in water and average LET of some ionising radiation. and the medium. For protons in air n = 1.75. Table 3 summarizes thesome LET values in water. The track-average values of LET are calculated by dividing the initial energy by the penetration depth. More sophisticated calculations have been employed with a cutoff at the minimum ionisation energy. 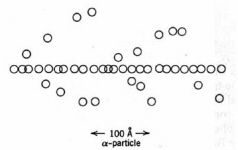 about 20% of beta particles penetrate to the maximum range owing to their broad energy distribution. In addition to energy deposition, electrons undergo elastic electron-electron collisions leading to multiple scattering and curvature of the tracks which complicate the dosimetry in extended sources. 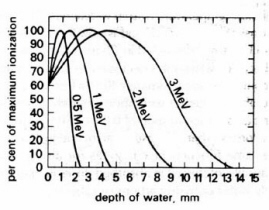 In water, the maximum absorbed dose is reached at about 0.8 mm depth for 0.5 MeV electrons, 1.5 mm for 1 MeV electrons, and 5 mm for 3 MeV electrons (Fig. 9). where matt is the linear attenuation coefficient. The reciprocal 1/matt is the distance in which the intensity of a narrow beam of monochromatic x-rays or gamma-rays decreases by approximately 63%. Unlike heavy charged particles and fast electrons, the maximum dose is delivered by a narrow x-ray beam at the front surface of an absorber. The specific interactions that contribute to matt depend on the medium and photon energy. 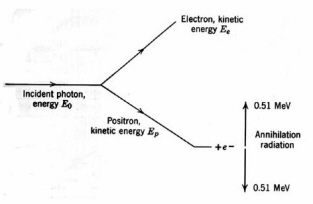 The photoelectric effect dominates at relatively low photon energy energies. In the photoelectric effect a photon is absorbed and an electron is ejected from the target atom. The outer K-shell energies are relatively low for "low-Z" materials, e.g., about 500 eV for the water molecule. High-Z materials emit more energetic secondary electrons, e.g., about 70 kev for tungsten.For photons of sufficient energy, an electron in the K-shell is ejected about 80% of the time and 20% of the photons interact at the innerL-shell. The "hole" in the L-shell is filled by an electron from the K-shell accompanied by the emission of a "soft" x-ray photon. The secondary photon is absorbed by another photoelectric event in a different atom or in the same atom; the latter process is the Auger effect. Figure 10. The Compton effect. The scattered photon may initiate additional events. MeV. The two newly created particles lose energy by collisions with atoms of the medium. A thermalized positron may be trapped in the electric field of an electron of opposite spin, forming the hydrogen-like species positronium. Positronium decays after about 0.1 ns by forming two 0.51 MeV "annihilation" photons emitted in opposite directions. Overall, pair production leads to energetic secondary electrons and 0.511 MeV photons. The efficiency of pair production increases with photon energy above 1.02 MeV and is very nearly proportional to Z. The absorption coefficient for photoelectric emission and Compton scattering in water are equal at approximately 50 keV, above which Compton scattering dominates until about 2 MeV when pair production starts to contribute and equals Compton scattering at 100 MeV. For example, 47% of the energy carried by 60Co gamma-rays (1.25 MeV) is lost out of the incident beam after traversing 10 cm of water, of which 22% is absorbed and 25% is scattered. Experimental depth-dose curves for x-rays and gamma-rays depend on the beam geometry. The average track length for a highly collimated beam of x-rays or gamma-rays equals 1/matt for measurements with a small, on-axis detector. 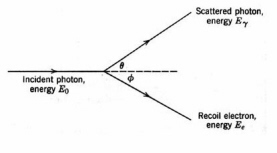 The attenuation of a broad photon beam is more complicated because scattered photons can contribute to the local density of photons and secondary electrons. Experimental measurements show that the density of secondary electrons builds up to a maximum within the irradiated surface and then falls off exponentially deeper into the medium. Table 4. Slow neutron scattering and absorption cross sections by atoms in biological materials in their natural abundance. by emitting a proton or a gamma-ray. Table 4 gives the scattering and absorption cross sections for reactions of thermal neutrons with light elements in their natural abundance. The unit of cross section in this table is the barn; 1 barn = 10-24 cm2. (This unit originated from the concept of hitting the side of a barn with a projectile.) The (n,g) reaction of neutrons with H atoms generates 2.2 MeV gamma-rays and the (n,p) reaction with N atoms generates 660 keV protons. Most of the damage in biological materials from slow neutrons results from the secondary protons and gamma-rays emitted by H atoms and N atoms.